Akit's Complaint Department: Support Caltrain's Weekend Baby Bullet Service - Ride It! Support Caltrain's Weekend Baby Bullet Service - Ride It! Caltrain is getting hit hard with some serious budget shortfalls since the agency depends on funding from SFMTA/Muni, Samtrans, and VTA. But while they had to cut a few trains here and there, the one cool bonus is the pilot program for weekend Baby Bullet train service. 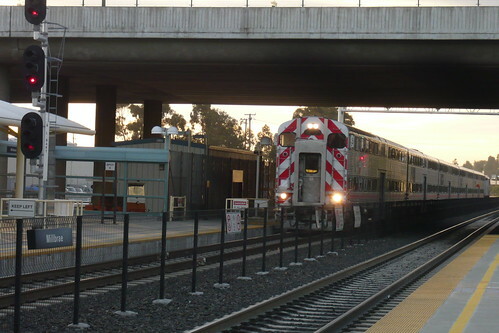 If you have ever taken Caltrain on the weekends, all the trains are local, and it can take a long while to get to your destination. The popular Baby Bullet that provides express service on the weekdays are now on weekends for the next couple of months. I'd say, that's a great benefit, especially I'm not 100% comfortable driving my car on the 101 or 280 from SF to San Jose. While it is great to get from SF to SJ in about an hour, one of the big problems is they are only running one bullet train set for the entire weekend service, and the timetable shows that it better benefits South Bay residents wanting to visit San Francisco because the schedules are in favor of them (e.g. mid-morning express, versus the early afternoon southbound express). If Caltrain wants to be impressed that Baby Bullet weekend service should stay, we need to ride it to our favorite destinations. I plan to take it this gorgeous weekend down to San Jose for some of the best ramen at San Jose's Japantown and ride the light rail to Miliptas for some new shoes. If Caltrain believes this is too popular, maybe they'll add on additional service for more flexibility. Keep on riding everyone!